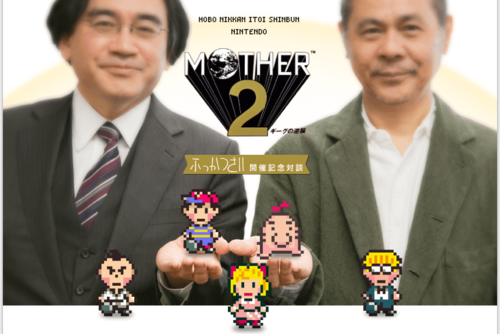 Last week a three-part MOTHER 2-related discussion between Shigesato Itoi and Satoru Iwata was posted on Shigesato Itoi’s website. If you can read Japanese, check it out here. 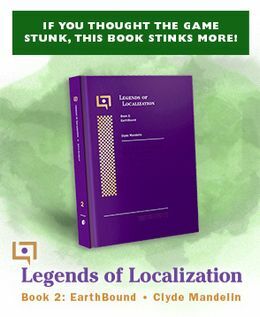 If you don’t read Japanese, fear not, for KameDaniRyuu has translated them for English-speakers! I actually haven’t read through all of this myself yet. Itoi kept saying afterward how he didn’t say very much though, which seems to be the case from a quick skim. Hopefully there’s good stuff in there, though! Iwata: Yes, that’s fine. We are also preparing Game Boy Advance games to be offered on the Wii U as well. Iwata: That was our feeling when we decided to release Mother 2. That makes no sense. Especially with Porky. ^What he meant is that they’re thinly connected by antagonists. No, it’s the power of the Eight Melodies! Iwata needs to take charge for the fans, call up Reggie and tell him, you WILL be releasing the game this time. It would just look rediculous to only have it in Japan at this point. If there was still a real threat of lawsuits then NCL themselves would be getting sued at some point. Don’t see how keeping it out of the U.S. is going to pacify the big bad RIAA boogeyman the lawyers are worried about. For what it’s worth, the closest thing it had to a Japanese Wii Virtual Console release was the demo in Brawl. This is the first time it’s ever been playable since Mother 1+2 for the GBA. And it did well there. I strongly encourage you to read the rest of it. It is mentioned that the entire reason why this revival happened is because of a tweeter who tweeted Itoi saying they really wanted to play the game again. That being said, it’s probably worth thinking he would have a positive reaction if he heard from us that we are serious when we say we would like to play the game again, here in the US. ^ He already knows that people outside of Japan want to play Mother 2. Turns out the RIAA has a bit of a hard time suing Japanese people in US courts for violating US laws in Japan. Who would have thought? @Darien Interesting, who woulda thought? I still say Iwata needs to take charge on this though. Obviously it probably wasn’t the only thing that sparked the revival. I simply mention it because it seems that it did have some effect. Yes, I know that Itoi knows that people outside of Japan want to play Mother 2, but clearly that hasn’t been enough for them to release it over here. I’m just trying to perhaps throw a little inspiration into to the mix to encourage us American players to keep asking for the game to be re-released here. And it looks like Itoi reads his tweets. I’m not talking about bombarding NOA with shouts of “RELEASE THE GAME GOSHDARNIT. WHERE IS MOTHER 3? WHERE IS MOTHER 2 ON THE VC, REGGIE?” I’m talking about using different means to ask assertively, and kindly instead of an overly agressive way. Hey, just my two cents. I really do think that if there’s any campain needed later that this situation is a different beast than Project Rainfall and we need to keep the focus this time on Iwata and NCL due to Reggie and NOA’a persistent attempts to bury the game. If Iwata is really in charge and respects Itoi’s wishes that the game be released elsewhere, then he should be taking the initiative to make it happen. Otherwise I predict months of wasted time and resources spent with little to no payoff other than Reggie playing his same old song and dance of “EB is a great game and I’m trying to study up on it but you need to talk to Iwata” and vague, redundant NOA PR responses. I’ve read comments from former NOA employees that NCL maintains strict control over NOA giving them little room to move on many decisions. So if that’s true and NCL really is in charge and Reggie says we need to speaking to Iwata, then let’s act accordingly and take the campaign in that direction. ^ Agreed. I do think we have a better chance than ever for a rerelease, and now when the irons hot would be the best time to convince NCL and Iwata to get the game rereleased outside Japan. I don’t think Mother 2 will ever get released outside of Japan. Granted, its great that Mother 2 finally got released… in Japan, but it doesn’t matter because there are different copyright rules in Japan than in the USA. NOA has proven that they don’t care about the franchise. Heck, the ESRB rating for Earthbound was a mistake, showing that NOA had no intentions of pushing the game towards being on the Virtual Console. The amount of legal issues that would take to get the game outside of Japan along with NOA’s negative attitude towards the franchise = Mother 2 is never coming out here. Part of the reason why I’m learning Japanese is so that I can play RPGs in Japanese. That way, I don’t have to pay a ridiculous amount just to play an edited version of Earthbound (at least Mother 2’s copies come at a fair price). It’ll take a few years and I do have to import a Super Famicom, but at this rate, I’ve given up on any further releases outside of Japan. Funny how Tezuka fans in America get a better treatment and those fans don’t fare well at all (and yes, I’m one of those few fans).